The camera screams, “pick me up and get snapping,” and it’s easy to keep a hold of, with a raised vertical strip underneath the shutter release offering a comfortable grip, with some raised dots on the back giving some extra purchase. Push it in and you’ll get the Quick menu superimposed over the top of the screen, letting you quickly access functions depending on the shooting mode. 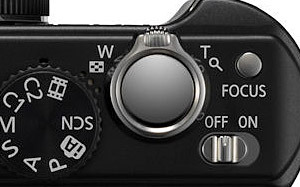 For example, in Aperture or Shutter Priority modes, you can swiftly adjust the aperture and shutter settings respectively, with both parameters also being adjustable in full manual mode. Underneath the joystick is the four way controller for setting the self timer, flash mode and exposure compensation, with options to configure the down button to either review the last photo taken, adjust the film mode, sensitivity, white balance, metering, AF or Intelligent Exposure mode. An OK button sits in the middle, with a toggle display button and continuous shooting mode/delete button to the right. 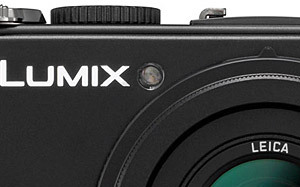 The DMC-LX3 has a small door on the right side of the body which accommodates a DC-input, a combined USB/AV port, and a component output for the optional DMW-HDC2 cable. This lets the camera output a 1080i signal for HDTVs (with HD movies scaled from their native 720p). Under the camera there’s a single door holding the 1150mAh Lithium Ion battery pack and SD memory card slot. We found battery life to be pretty good, and still had juice left after 250 shots. Conveniently, the battery is exactly the same as the one fitted to our Ricoh GR/GX200 cameras, so – for once – we didn’t have to go out and buy more back up batteries. 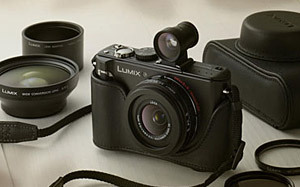 One major irritation with the LX3 is need for a removable lens cap – something we really hate. It’s easy to miss a critical moment when you’re fumbling about trying to get the lens cap off, and the lens is too vulnerable to leave it off. 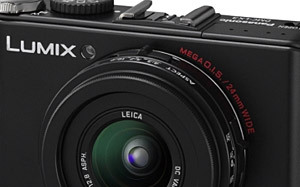 The more details and conclusion are available in part 3 of the Lumix LX3 Review.